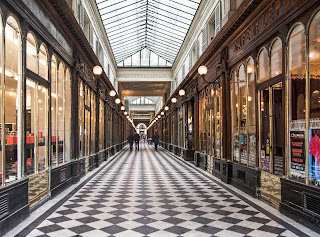 Window-shopping — one of the most popular pastimes in Paris since the invention of footpaths. 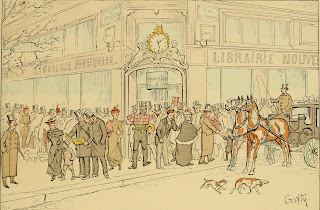 Before the introduction of separate spaces for vehicles and pedestrians, shoppers mingled with horses and carriages on the street, and usually ended up with their shoes and clothes covered in mud — or worse! 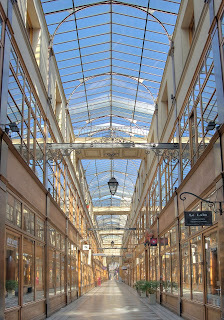 Another innovation to improve the lot of the flâneur came in the early part of the 19th century: covered shopping arcades. Here, shoppers could move around in comfort and safety, protected from the weather and the traffic. By the middle of the century there were around 150 passages couverts in the city. Each one connects two streets and is lined with small shops, galleries and cafés. The passages are covered with iron-and-glass ceilings to allow natural lighting in daytime. Here are some examples of the remaining passages. 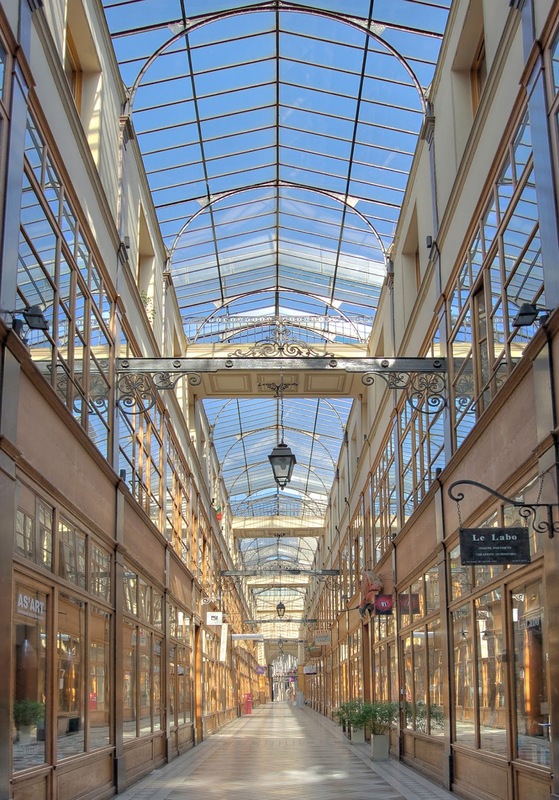 One of the shortest, at just 80 metres, is Galerie Véro-Dodat near the Louvre. Its modest length is somewhat disguised through the impression of perspective created by the diagonal pattern in the black-and-white floor tiling, and the relatively low ceiling. The parts of the ceiling that are not glass are decorated with beautiful engravings. 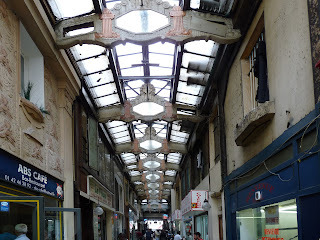 It is also one of the least frequented of the covered passages, though this adds to its charm. Closer to the classic style is the Passage du Grand-Cerf. Its 12-metre ceiling is one of the highest of all the passages. Opened in 1825 on the site of a hotel of the same name, it fell gradually into decay before being fully restored in the 1980s. 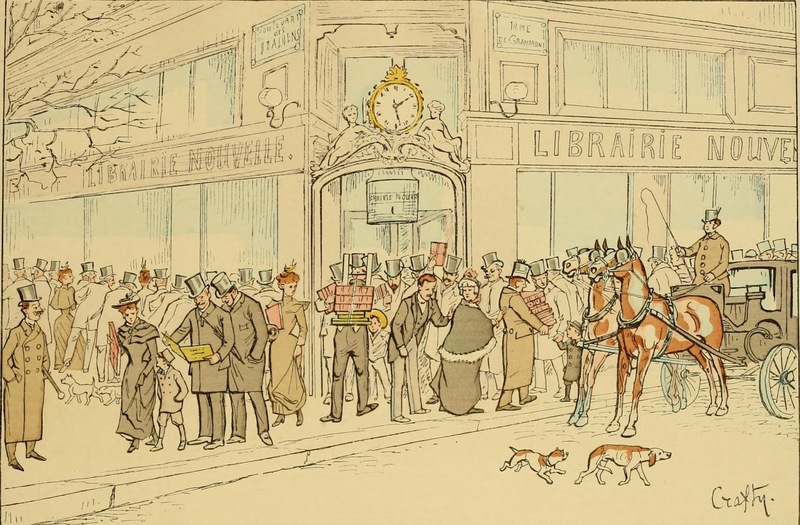 Today it houses fashion boutiques, furniture stores and jewellery workshops. And if you like knitting, you’ll find what you need here. The Passage du Prado, named after the museum in Madrid, was built in 1785 but wasn’t covered until 1925. It is certainly not the most chic of the passages, but it has its charm nonetheless. The two branches of the passage are perpendicular; the junction is covered by a glass dome in a metal frame. 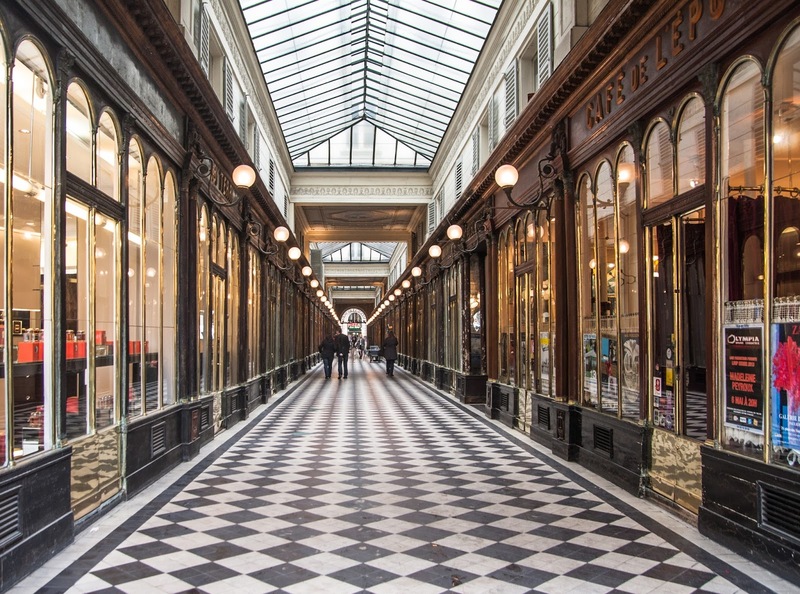 Many of the covered passages of Paris were destroyed during Haussmann’s restructuring in the 19th century, others disappeared as department stores became more popular. Only around 20 survive today, each one worthy of a visit. For more information, visit the official website of the Paris Convention and Visitors Bureau.